The Sandpoint City Beach was originally the meeting place for the Kalispel Indian Tribe. The residents of the newly developed city of Sandpoint improved the area that became the city beach. Long before the Europeans invaded north Idaho, the semi nomadic hunting/digging/fishing Kalispel Tribe made the shores of Lake Pend Oreille their home. These “Canoe People” or “Lake Paddlers,” as they were called by neighboring tribes, established several special camps and meeting areas in Bonner County. One was the meadows at the mouth of the Clark Fork River (Nacemci) and another was the Qapquape or sandy place near the mouth of Sand Creek. Pow wows and gatherings were held in Clark fork until the 1950’s. However, the Sand Creek meeting place was not used after the 1930’s partially because of the recent arrival of Europeans. Settlers started moving to the land around the mouth of Sand Creek in the 1890’s. Some sources indicate Sand Point (now Sandpoint) was named by David Thompson, a fur trader, when he passed through the area about 1809. But the name could have also been an adaptation of Qapquape. The town leaders realized this sandy point would be an ideal place to build a city beach and park to draw in tourists. The planning of this new beach started in 1915. 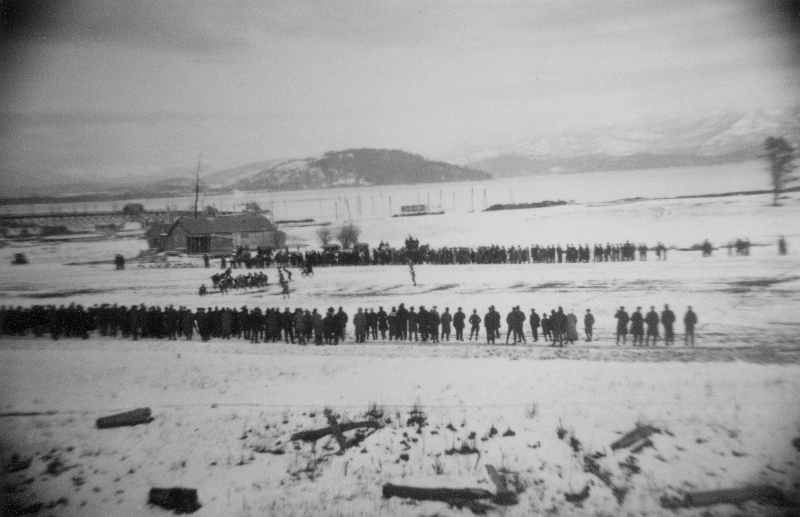 The Northern Pacific Railroad leased the land to Sandpoint for the use of a public park in 1922. The plan was not set in motion until 1939 when Franklin D Roosevelt approved the request to have WPA (Works Progress Administration) fund the beach project for $61,949. Dredging equipment was brought in to move sand from the lake bottom to the beach site to raise the land above the high water mark. The fight began! In the fall the equipment moved the sand to the beach and in the spring the lake reclaimed the sand. It wasn’t until the 1950’s when the Cabinet Gorge and Albeni Falls dames were built and the beach flooding issue was solved. From 1959 to present the local chapter of the Lions Club and the city of Sandpoint have improved the area with playground equipment, tennis courts, a beach club house and many other features. Today the 18 acre park hosts dances, art & craft fairs and the 4th of July fireworks. The one event still missing from the beach is the Kalispel Indian pow wows. Lake Pend Oreille offers a variety of recreational activities including boating, swimming and fishing for the Kamloop trout and the Kokanee salmon. Much of that activity is focused in or around the city beach. The Sandpoint city beach has become the tourist destination that the early town leaders envisioned. The sandy point (circa 1900) where the city beach would be located. : Indian teepee (circa 1900) on the bank near what is not the boat launch area of the beach. The sandy bar of land was originally a gathering place for the Kalispel Indians. An annual pow wow was held by the Kalispel, Flathead, Kootenai and Coeur d’ Alene tribes until 1934. Courtesy of the Bonner County Historical Museum. Indian camp on the beach near Sandpoint: Indians camping at the city of Sandpoint City Beach. The land was originally a sand bar covered with grass and sparse trees. Courtesy of the Bonner County Historical Museum. 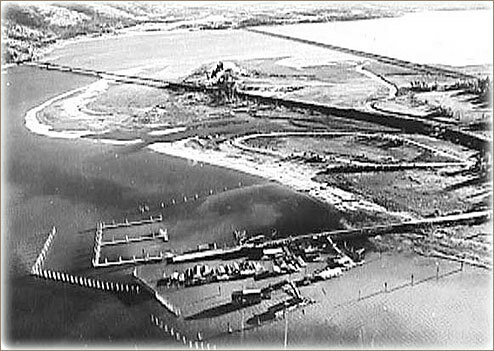 Sandpoint City Beach in 1940: Sandpoint City Beach & city docks in 1940. There were no buildings or improvements at the beach during this time. The Northern Pacific (Burlington Northern) tracks are in the middle and the upper bridge is the Long Bridge crossing the Pend Oreille River. The city docks were removed when the beach was improved. Courtesy of the Bonner County Historical Museum. 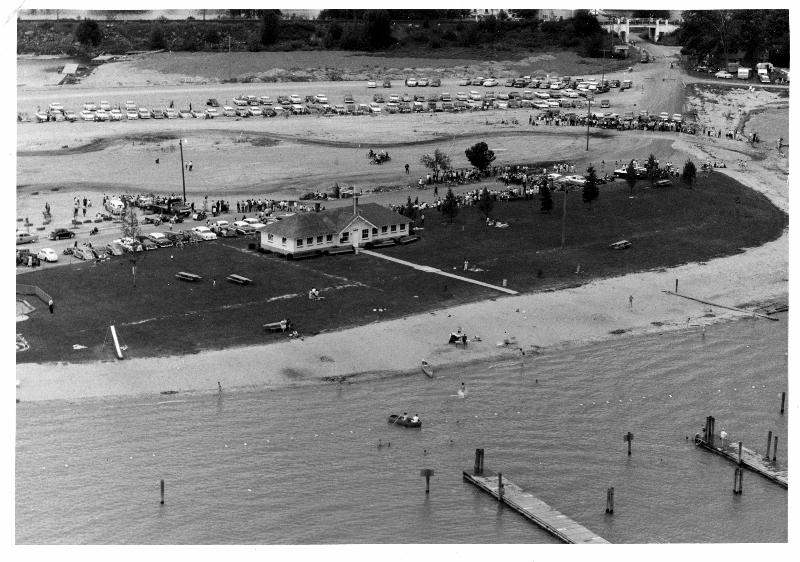 Sandpoint City Beach in 1950.: Aerial view is of the Sandpoint City beach in the 1950’s. The newly built beach house was the center of the park area. The entrance to the beach (top right corner) was from Bridge Street and under the Burlington Northern (Previous Northern Pacific) railroad. Courtesy of the Bonner County Historical Museum. Football at the city beach in 1920: Sandpoint City Beach also hosted football games in 1920. It appears winter came early this year. A rustic beach house is seen to the left as well as part of the city docks. 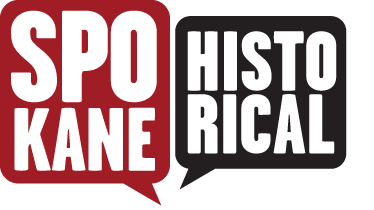 Courtsey of Bonner County Historical Museum. 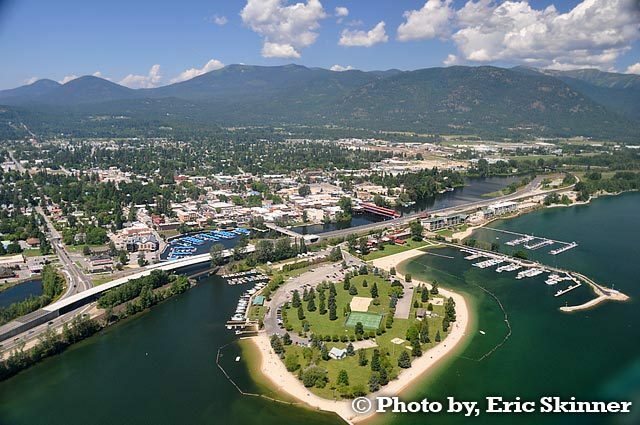 Today's Sandpoint City Beach (2014): Sandpoint City Beach and Park in 2014. The log enclosed areas are safe swimming sections. The loop drive around the beach was filled in with grass. 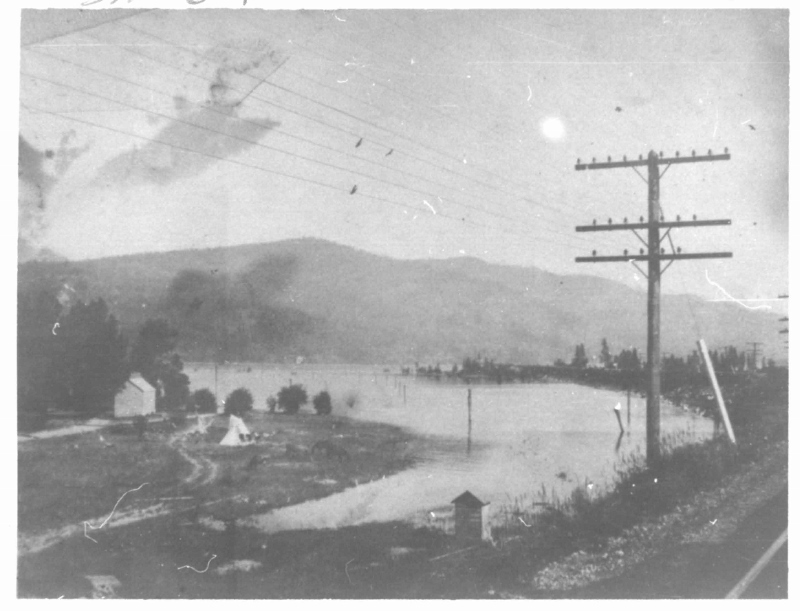 The narrow strip of land between the highway and railroad track just above the beach was the original town of Sandpoint in 1890. Courtesy of Eric Skinner. 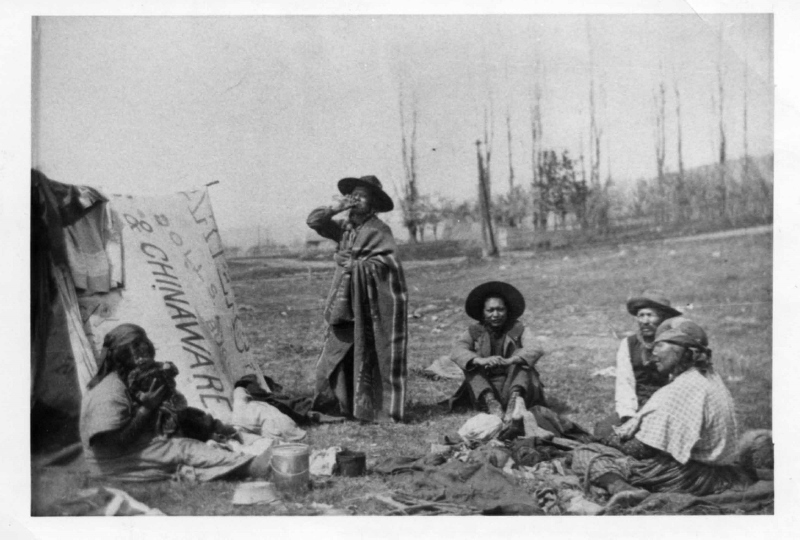 Mary Garrison, “Sandpoint’s Qapquape,” Spokane Historical, accessed April 20, 2019, https://spokanehistorical.org/items/show/581.